Genus summary: Lasioglossum (/laz-e-o-GLOSS-um/) is a very large genus that occurs worldwide. There are approximately 280 species in North America and approximately 87 species in California. They are often the most common bees in a habitat, but are frequently overlooked because of their small size. Lasioglossum closely related to the genera Halictus and Agapostemon. These genera are commonly called “sweat bees” because they are known to be attracted to human sweat, which they drink for its salt content. 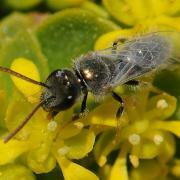 Description: Lasioglossum are dusky black to brown, dull green or blue slender bees, with bands of hair on their abdomen. They are tiny to medium sized bees ranging in size from 0.1 to 0.4 inches (3-10 mm) long. Females carry dry pollen on scopa (brushes of hair) on their hind legs. Under a microscope, you can see that in the fore wing the basal vein is strongly arched at the base of the vein and that the submarginal cell are weak which means they look like a single line. Similar species: Lasioglossum are similar to Halictus but can be distinguished by the location of hair bands on the segments of their abdomen. Lasioglossum has bands of hair on the innermost portion of each segment, whereas Halictus has bands of hair on the outermost portion of each segment. The wing veins in Lasioglossum are also not as thick as those on Halictus. 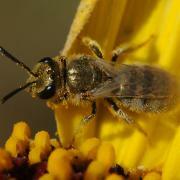 Food sources: Lasioglossum are a mix of specialist and generalist foragers. Specialists are known to be attracted to Oenothera. At least one species that is a generalist has a strong preference for Clarkia. Nests: Lasioglossum includes species that exhibit the full range of bee social behaviors, including solitary, communal, and social habits. Most species nest in the ground. In social colonies, daughters remain in the nest and help care for the young. Some of the social species have small nests with a single queen and a few workers whereas others build long-lived nests with multiple queens and hundreds of workers. Some Lasioglossum have glands that produce a mix of chemicals called lactones. Each individual bee has its own unique combination of lactones and lines the nest entrance, burrow and cells. This helps workers recognize their own nest when they return from foraging. Flight season: Early spring to summer. Some species persist into fall.